This past month just flew by with major things happening in our house – my daughter starting 4K, me starting my own all natural foods direct sales business, and my son’s 3rd birthday! 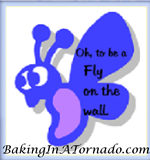 Lots of great blogging material in the queue, so come back to read all about it someday! One of our favorite activities to do on Wednesdays is venture to the Farmer’s market. I bought some beans and made them for dinner. Little bro said, “These beans are dirty.” He then took a few to the bathroom sink to rinse them off. I tried explaining, “It’s seasoning, not dirt!.” Oh well…at least he ate them! As an adult I told Daddy O. that I dreamed of riding on a tandem bike together as an older couple (after seeing tandem bikers while biking/traveling in Switzerland). Here I was riding with a tag-along bike with my daughter, which I suppose was just as good, if not better because of her excitement. Dreams DO come true, though sometimes they materialize in different ways. One hot day we made chocolate pudding pops. Big sister exclaimed, “This is the best day EVER!” It is truly the little things in life that count, right?! Daddy O: I think little brother has athlete’s foot. Big sister: One time I had an athlete foot. And I pulled off the athlete. Daddy O: That’s not exactly what it means. Little brother: I have athlete’s foot. Big sister: One time I peel off athlete. Daddy O: Athletes are people who play sports. You don’t peel them off. Athletes sometimes get it from playing sports. Big sister (persistent): Mom, I had a lot of athletes. I peeled them off. 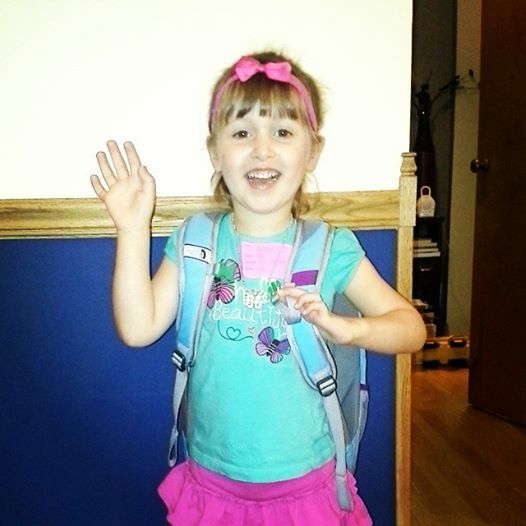 Big sister waving goodbye on her 1st day of school. Sniff. Sniff. Her comments after morning one of school: Mom, some kids were arguing at school. I wasn’t arguing. Me: What did you do sweetie? Big sister: We ate cheezie weezies for snack (the most important detail I guess). Getting ready for school went really well the first few days, especially wonderful because big sister isn’t always a morning person. That has since faded, much to my dismay. Eating and picking out clothes are the longest activities! I try to give suggestions, like putting leggings under a skirt to stay warmer, but my daughter told me, “Mom, you’re trying to dress me weirdly.” Oh man…I’m sure I’ll be hearing that one again! Since starting school, I think big sister has begun to appreciate afternoons at home and weekends more. She remarked, “Quiet. I love quiet. I hate it when it’s loud.” This IS a new one that I hope is adopted more often in our house! We do live in an older home, but have no immediate plans to move. Some family members have recently moved, so of course, big sister wants to move too. Big sister: I don’t like our old house. Me: Well, there are a lot of things Mom and Dad like about our house. Why don’t you like it? Big sister: The doors. I want pink doors. Little brother: I want the door to be green. Daddy O: When you have your own house you can have whatever color door you want. 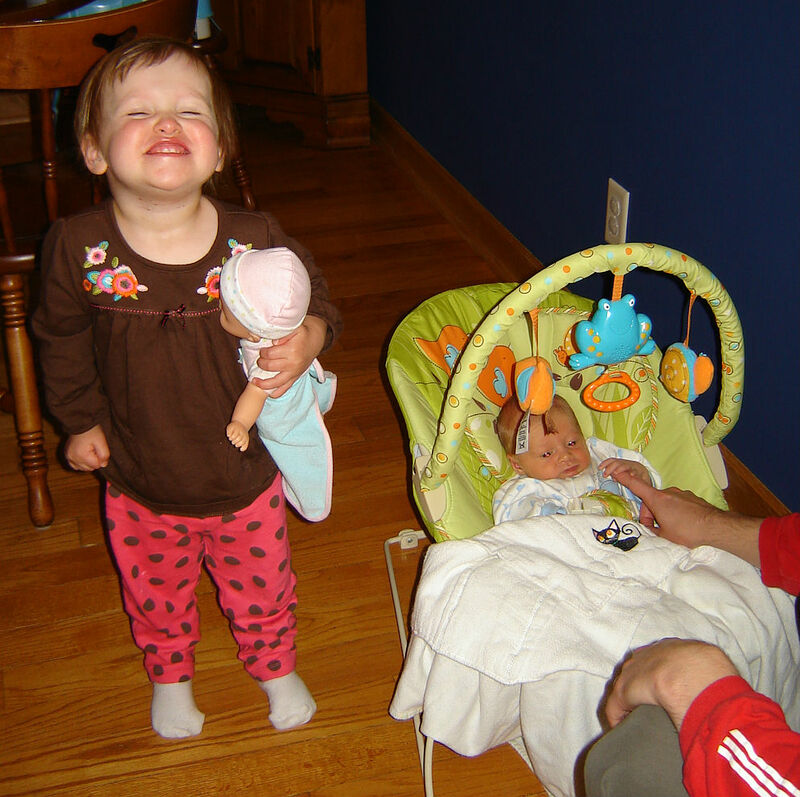 Maybe we’ve honed our parenting skills for the toddler years, remembering what worked well for big sister’s two-year-old antics. Maybe we’re just a little more laid-back this time around. Maybe God has answered my prayers for patience. Most likely it’s a combination of all of the above. It’s true that little brother is different than big sister in many ways. He’s much more talkative, a little more easy-going, more physical in terms of biting and hitting, and is definitely into trains, cars, and balls. 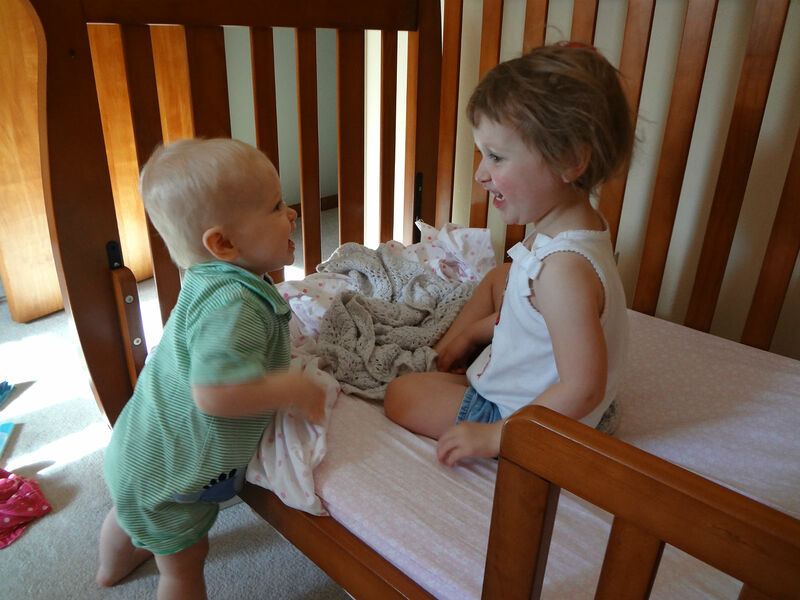 Big sister is more than happy to tattle on him whenever he breaks a rule. She is very black and white and likes things to go HER way when she plays with little brother, though they can be so sweet together (see my post One Thing that Surprised Me Most as a Mom for more about the brother-sister relationship). During moments of conflict, I tend to give them space to see if they’ll figure it out on their own, but intervene when I hear screaming and crying. My Two Year Old Cutie-pies (and 4 Year Old Big Sister). I think they are pretending to be kitties. Distraction. While little brother cried & screamed on a car ride over the holidays, I quick yelled, “Look – Christmas lights out your side (of the car).” The shiny Christmas cheer magically quieted him down. Food Bribe. Little brother and I were having a standoff at the grocery store. All of our gear and big sister were loaded into a shopping card already. He didn’t WANT to go in THAT cart. I didn’t want to reload everything in HIS chosen cart. We waited. He screamed. We waited some more. I checked in with him to see if he was ready to join us, and he screamed some more. I waited more. Finally, I offered him a granola bar that he could eat if he rode in Mom’s cart. He finally agreed. Another kind mom came up to me, having witness this all unfold, and complimented me on how I handled the situation. It was really kind of her! Don’t we ALL hate tantrums in public?! Asking questions. After some crying and screaming, I’ll calmly ask little brother, “What do you want? I can’t understand you right now. Can you use words?” This can typically help. Get favorite blankie & paci. We find his favorite blanket and pacifier to help him calm down. At two and a half, he doesn’t use his paci THAT much (mostly at night), but it still gives him comfort. Our dentist and pediatrician have encouraged us to simply let him give it up when he’s ready, so for now the pacifier and favorite blanket bring some peace and quiet to the raging two-year-old. Time and space. Sometimes you just have to let it out! Little brother has been wanting to hear the end of songs when we drive home, which means sitting in the car. Sometimes, I oblige and let him listen until the song is over. One day with below zero temperatures, it wasn’t going to happen, so I carried him unwillingly inside. I gave him time to cry & scream by himself, and in a few minutes he was ready to return to calmness and fun. I’m curious to see how we continue to navigate Little Brother’s second year. As is common with kids, just when you think you have things figured out, things can change! How do you cope with the terrible twos and tantrums? Have a great day and almost TGIF! Be my Baby for a little longer! “I wanna be your baby,” my son whines in his little two-year-old voice. This is code for, “Please hold me like a baby, Mom.” I’ll also sweep my kids into a cradle hold whenever they say in short code, “Baby.” I can’t resist it! It started when getting them out of the tub and wrapping them up in their hooded towels. Snuggling them by holding them as if they were a baby simply worked the best at warming them up. Since the post-bath snuggles are fading away, I only hear, “I wanna be your baby” every so often – usually when my son gets hurt and rarely from my daughter (who is approaching age four). There is part of me that just wants my little boy to stay my baby a bit longer! When big sister turned two, I was very busy with a two-month old little brother, so I didn’t have time to mourn her entering toddler-hood. My son is quite the mama’s boy and can still be clingy at times….often demanding and yelling, “I wanna come up!” Though this gets extremely annoying, I usually cave and pick him up. Sigh…I know these days won’t last forever. Sniff. Sniff. Not going to slow down for your picture! You may not want to hear this little man, but you will ALWAYS be my baby! Have you celebrated a big milestone lately? How do you react to your babies growing older?